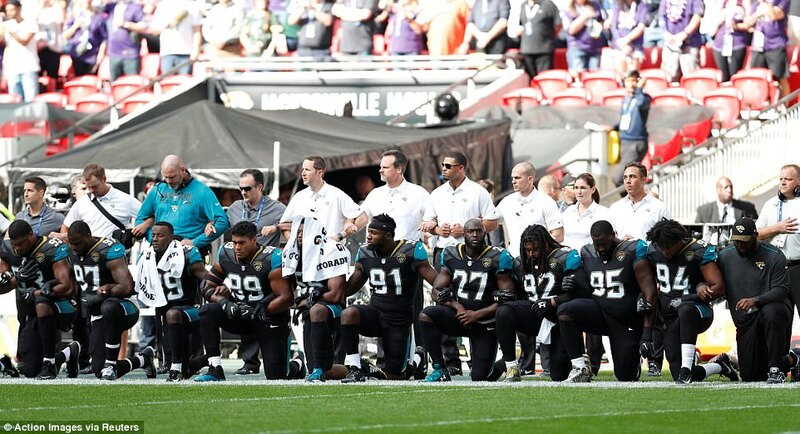 Jags, Ravens, diss Trump in London! 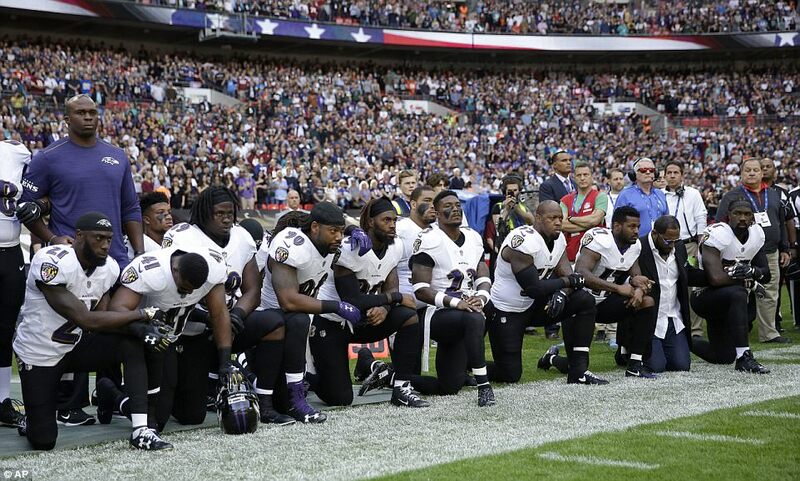 American football stars took a knee in defiance of Donald Trump at Wembley Stadium today after he said sportsmen who ‘disrespect America’ should be ‘fired’. 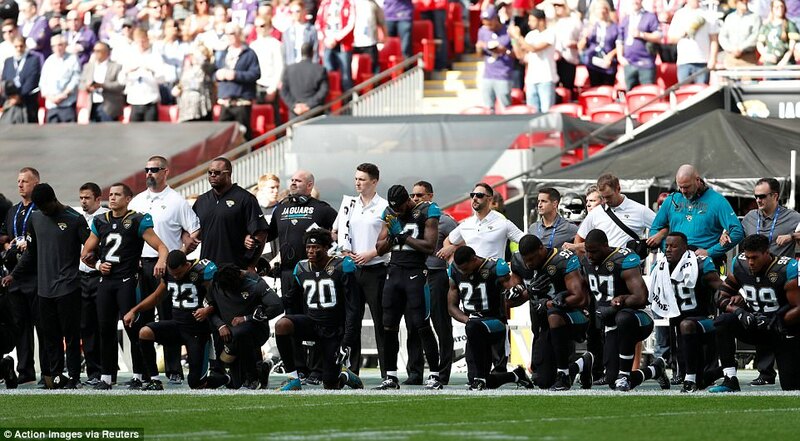 Players from both Jacksonville Jaguars and the Baltimore Ravens dropped to their knees as the national anthem was played prior to the match in London. 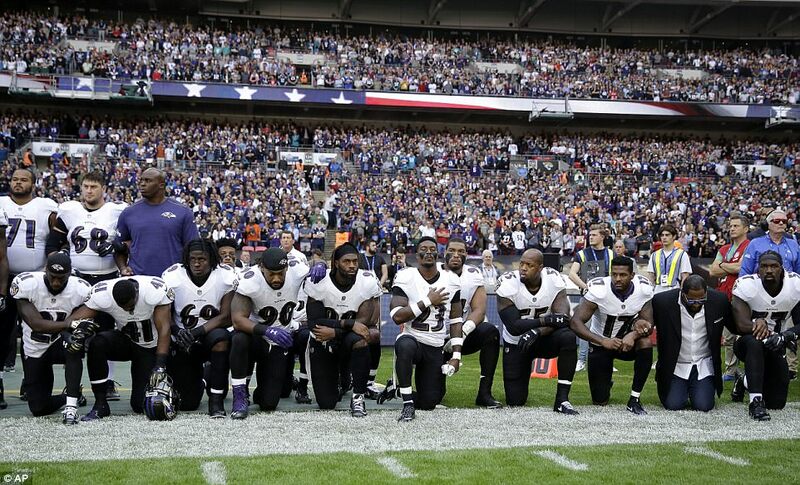 No players were kneeling during the playing of ‘God Save The Queen’, which followed the Star Spangled Banner. 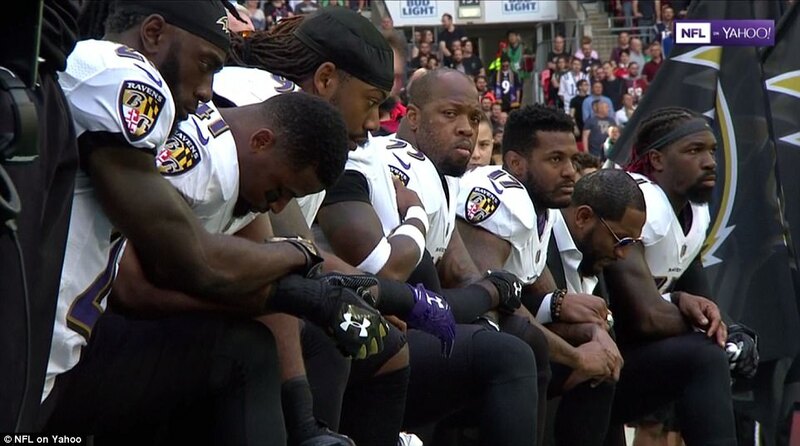 They did so after President Trump had stoked tensions by saying NFL players who protested during the national anthem should be sacked by their team. 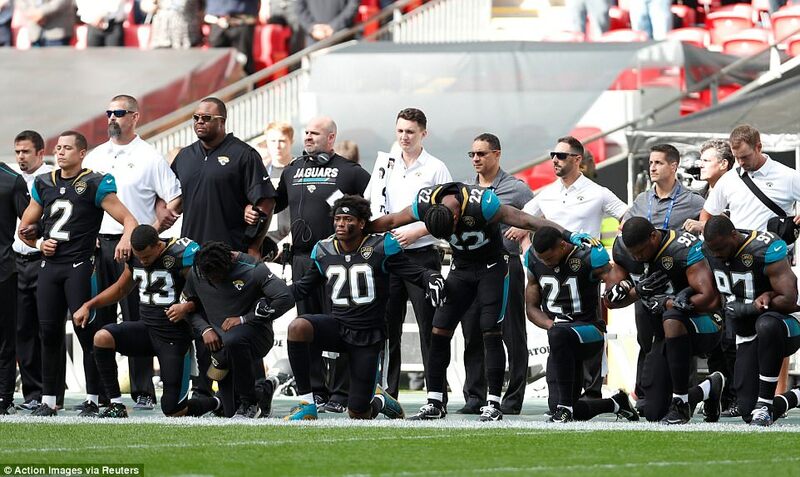 Players on both teams and Jaguars owner Shad Khan, who were not kneeling, remained locked arm-in-arm throughout the playing of the national anthem and ‘God Save The Queen’. Khan, who also owns Championship football club Fulham, has previously donated one million US dollars to Trump’s presidential inauguration. 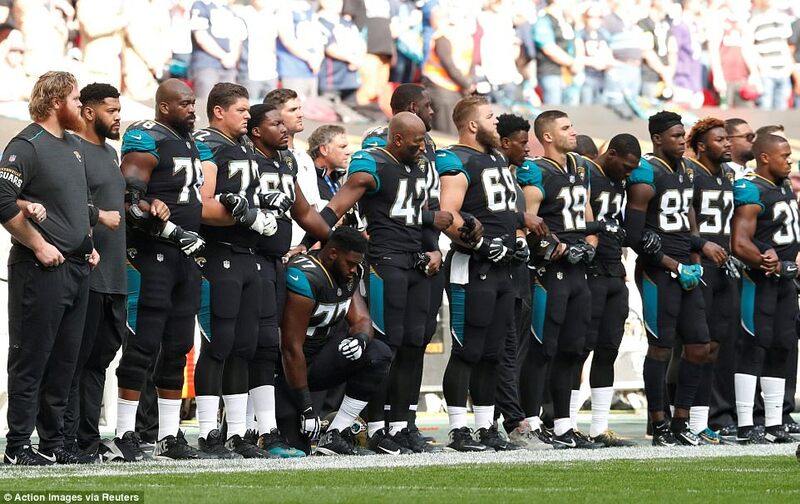 The Jaguars tweeted a photo of Khan standing, arm in arm with Lewis and Smith, with the caption ‘Unity’. 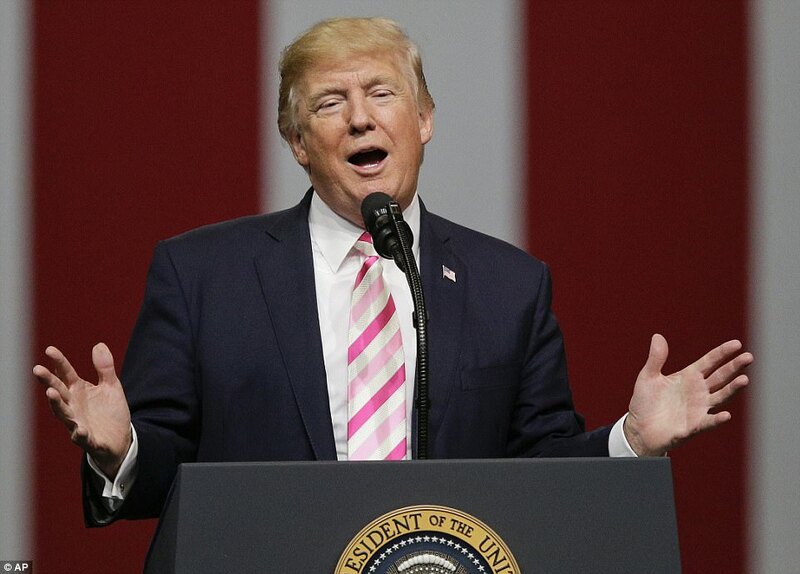 At a rally in Alabama on Friday night, Trump had delivered a scathing attack on NFL players who opt to kneel in protest when the Star-Spangled Banner is played prior to matches. 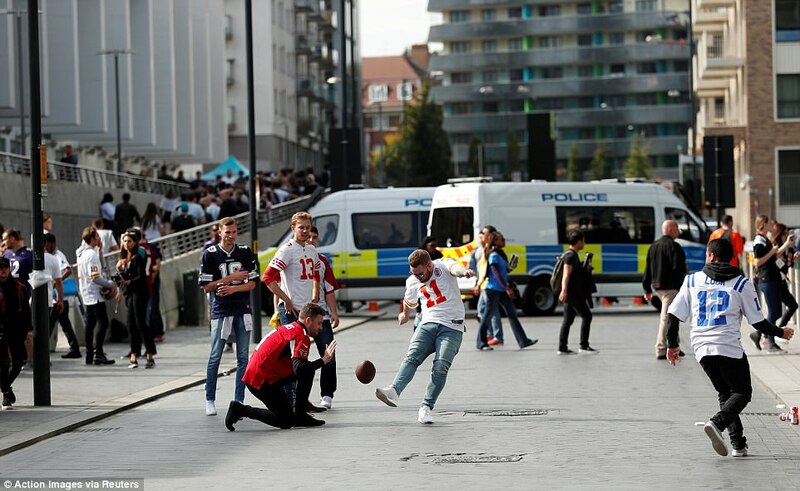 He claimed team owners should sack any player involved in such a demonstration and that fans should leave the stadium if they see it. 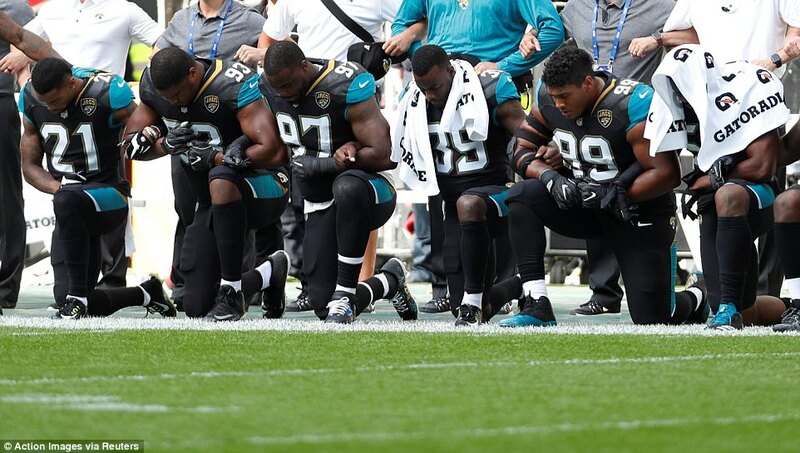 There was a fiery response from the NFL to Trump’s controversial comments. NFL commissioner Roger Goodell released a statement saying ‘divisive comments like these demonstrate an unfortunate lack of respect’. The NFL Players’ Association said Trump had crossed a line by effectively telling players to just ‘shut up and play’. Association president Eric Winston said Trump’s comments were ‘a slap in the face to the civil rights heroes of the past and present’. 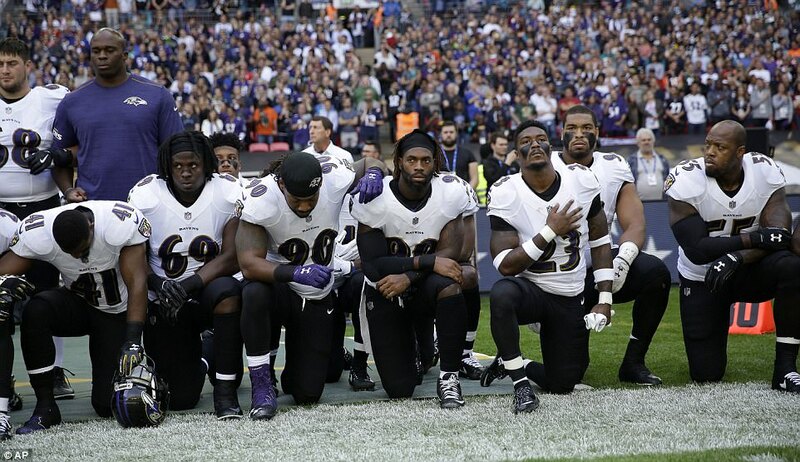 Some NFL players have kneeled or raised a fist during the national anthem to protest against police brutality towards black people. 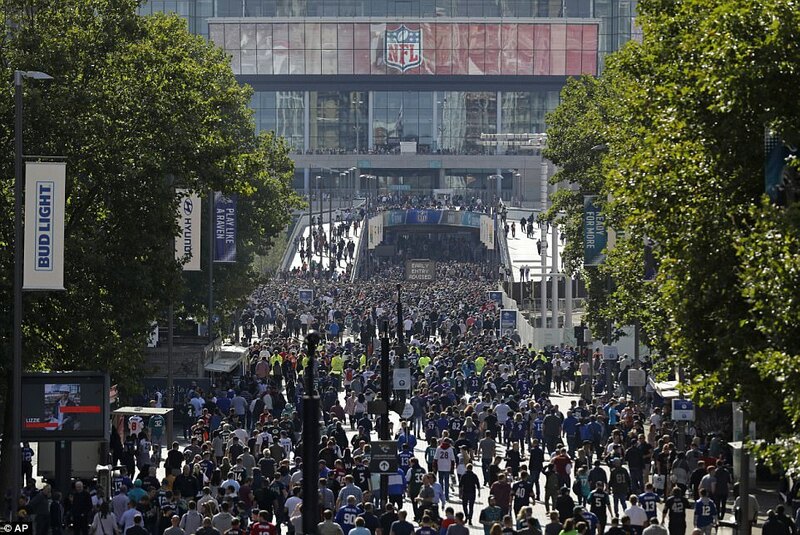 This has included high-profile players such as Colin Kaepernick, Michael Bennett and Marshawn Lynch. On Saturday night, the Oakland Athletics’ Bruce Maxwell became the first Major League Baseball player to kneel in protest during the national anthem. Trump’s comments drew sharp condemnation from some of the nation’s top athletes with basketball star LeBron James calling the president a ‘bum’. James also released a video on Saturday, saying Trump has tried to divide the country. Buffalo Bills running back LeSean McCoy went further, describing Trump as an ‘a**hole’. New England Patriots owner Robert Kraft, a personal friend of President Trump, responded in forthright fashion. 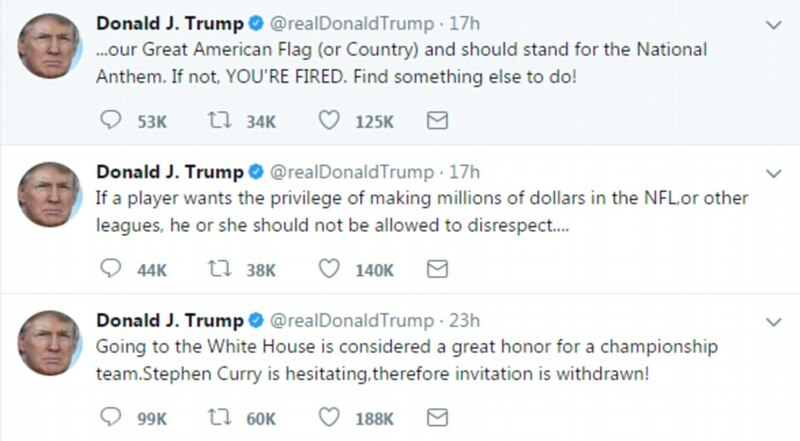 Trump started by announcing that NBA champion Stephen Curry, the two-time MVP for the Golden State Warriors, would not be welcome at the White House for the commemorative visit traditionally made by championship teams. 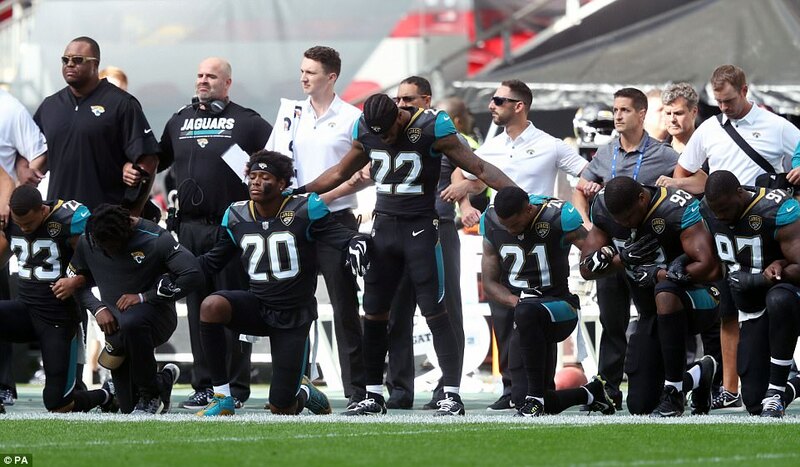 Later Trump reiterated what he said at a rally in Alabama the previous night – that NFL players who kneel for the national anthem should be fired, and called on NFL commissioner Roger Goodell to tell them to stand. 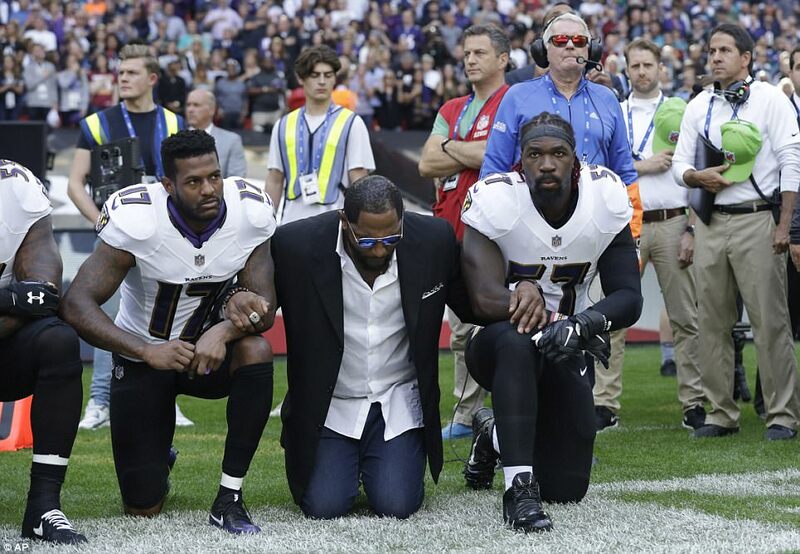 He stepped up his rhetoric today, urging fans to boycott NFL games as way of making change ‘take place fast’. The Golden State Warriors said the team had clearly understood ‘that we are not invited’ to the White House but would visit Washington DC on its own ‘to celebrate equality, diversity, and inclusion’. John F Kennedy was the first president to host the NBA champions, when the Boston Celtics visited in January 1963. The visit became an annual occurrence under Ronald Reagan. Golden State visited Barack Obama after winning the title in 2015.